The greatest skating game in the known universe returns in Tony Hawks Project 8 that immerse gamers into the definitive skateboarding experience using ultra-realistic graphics, enhanced physics and extremely responsive controls that simulate the feeling of skating with every trick and bail. The title challenges you to experience the intensity and pressure of skating against some of the worlds top pros in true to life competitions as they aim to become the #1 skater... this is, Tony Hawk's Project 8! With that said, the Tony Hawk series has fallen flat in the last few years with improved graphics but not much in the world of gameplay. Fortunately, those days are long gone and the developers have finally redesigned the world of Tony Hawk that harkens back to the original with state-of-the-graphics and amazing gameplay that gets it right from the first time you pickup the controller. The story of Tony Hawk's Project 8 features the clichéd tale of Tony Hawk visiting your home town in order to recruit the best skaters your town has to offer. These new skaters will make up a team called Project 8 who under the watchful eye of Tony and friends will endeavour to put the gamer through the loops by completing a wide gamut of missions, tricks and competitions in order to be recruited, sponsored and recognised by the world's greatest skaters. The XBox 360 version of Tony Hawk's Project 8 is easily the penultimate version on the console and features flawless gameplay in a magnificent 3D world that allows the player to interact with the environment to perform grinds on curbs, fences, wires and almost anything with a flat surface. In other words, the gaming world is a skater's paradise that I'm sure some believe is how >GOD< should have created the world... provided you believe in God... or is Tony Hawk God? Enough about religion... onto the game! As with previous incarnations, the gamer has the option of creating their own skater avatar and for those unsure of the world of Tony Hawk, the game features an extremely in-depth tutorial to teach you the basics of the game. Needless to say, the control system is perfect on the official XBox 360 controller and in only a matter of minutes, this old skater was once again performing those old skate tricks that made everyone in our offices "ahhh" and "wow". Interesting enough, the developers have implemented some subtle and major changes to the control system with some tricks requiring both analogue sticks to be used as each stick represents a different foot. This also helps the gamer in achieving air and even though it may sound complicated at first, the satisfaction you get when you pull this off is simply bliss and really adds to the gameplay. Graphically, Tony Hawk's Project 8 is one of the most beautiful titles that I have seen on the XBox 360 that features extremely detailed background environment and highly detailed characters that look stunningly familiar to their real-world doppelgangers. Apart from the highly detailed textures on the characters, the game is sickeningly smooth with perfect framerate to ensure that even the most "motion affected" gamer will have no problems at all with this game. 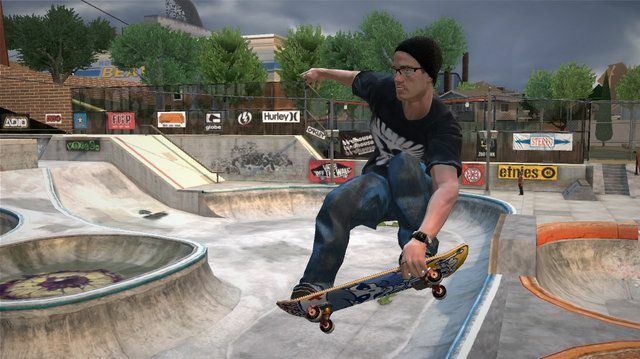 As with previous Tony Hawk skating games, the title features a thumping sound track with a plethora of bands, both mainstream and indie to ensure that this is a real-world representation of the skating world. Match that with some professional voice acting, and all the sounds and bumps of skating and you have one impressive sounding title. With a variety of mini-games and great XBox Live access, Neversoft have really got a winner on their hands that features one of the most biggest skating environments, flawless gameplay and state-of-the-art graphics that is definitely going to be one of the biggest games of the year. The best has finally arrived on the XBox 360!